I'll need to ask the new owners if I may unload all my potted plants at the new house the day before closing. The wagon will be filled with the computer and artwork, with everything else in the moving truck. 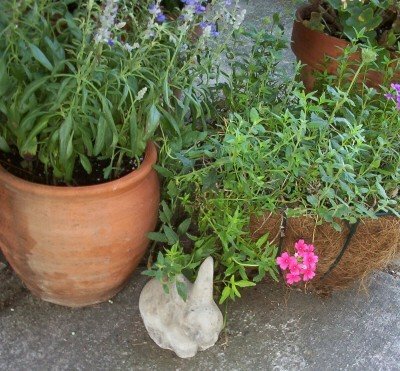 Someone emailed me with a question about potted plants: my secret is to start from seed or buy the smallest size available and then load them up with fertilizer through the summer. They tend to grow to unbelievable sizes. I do use organics with anything edible (herbs, tomatoes, etc.) but for annuals and potted gardens, Miracle Gro really is a miracle.This could be pricey if I didn't always see half-empty bottles of fertilizer at estate and moving sales. Think about it--no one ever boxes up the fertilizer! One of my favorite plants this year was a tiny sprig of sweet potato vine, now a luscious cascade of chartreuse. I love its delicate appeal. thanks for the pix and tips. I absolutely LOVE potted plants around. I must confess, though, that I've seriously mistreated mine this year and they show the results of my neglect. I'm resolving here and now to do better with them. Just wanted to "ditto" the MiracleGro. Great stuff that! Why don't you like to use Miracle Grow on your food producing plants? They have one for veggies. 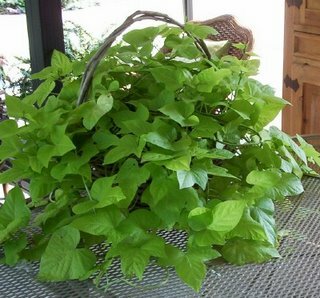 I love your sweet potato vine. It reminded me of an old Andy Griffith show where they ruined Aunt Bea's garden yet she won a gardening contest because of the "exotic and tropical" sweet potato plant in her flower bed. Gives me some good ideas since I love house plants as well but have to abandon them every move we make overseas.